January 16th, 2018, Charlottetown – Four P.E.I. speed skaters kicked off their 2018 competitive campaign with new records and personal best times at a recent competition in Chicoutimi, Quebec. The Island skaters were among 100 competitors at the third Quebec Provincial series meet of the season. 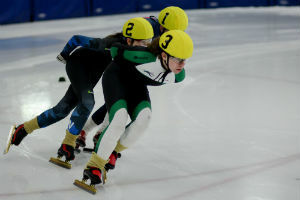 P.E.I.’s Jenna Larter (#3, foreground) set a pair of new provincial records for Junior women at a speed skating meet in Chicoutimi, Q.C., recently. Photo courtesy of Kristen Binns. Jenna Larter of Brookfield made the most of her Quebec circuit debut, picking up new provincial records for Junior women in the 1000 metre and 1500 metre distances. Racing in the top female group, Larter took eighth place overall, with new record times of 1:40.7 and 2:37.417 in the 1000m and 1500m, respectively. The P.E.I. skater also broke 50 seconds in the 500 metre distance for the first time. Stratford’s Andrew Binns grabbed fifth overall in Group 3, despite a pair of costly penalties during a weekend where he was first across the finish line in six of his eight races. Binns took an exciting win in the 1000 metre distance and had a new personal best time and third place finish in the 1500m distance to help overcome the penalty setbacks in his other events. Kyle Connell of Charlottetown placed thirteenth in Group 2 with a large personal best time in the 1000m event. Connell posted his best placement in the 1500m distance, coming up with tenth place in the strong group. Peter McQuaid, also of Charlottetown, posted the fastest times among the Island contingent. Skating in Group 1, McQuaid had his best showing in the 1000m event, where he placed tenth and skated just shy of his personal best time. McQuaid finished sixteenth overall in the top male group. Island speed skaters are now preparing for a pair of important events in the Maritimes, including the Atlantic Long Track Championship in Halifax in late January and the Atlantic Canadian Short Track Championships in Dieppe in early February. For full competition results and information on Speed Skate PEI programs, visit www.speedskatepei.com.